E Pluribus Unum. Out of the Many, One. 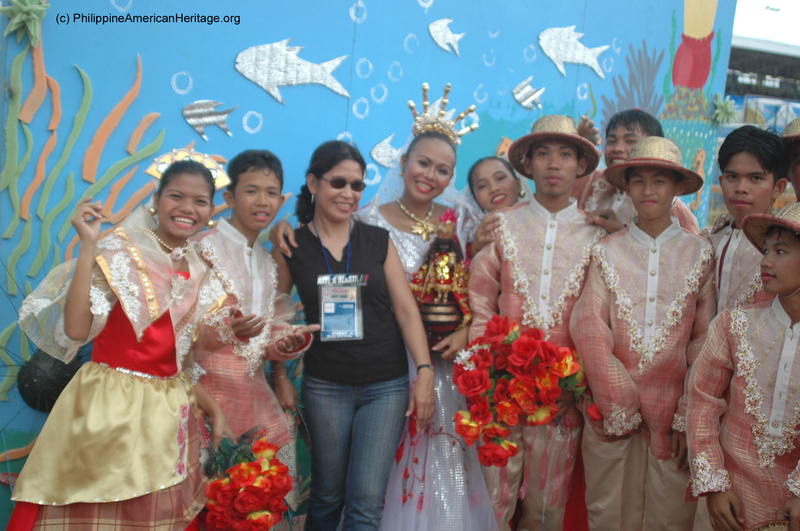 The Philippine American Heritage Council is participating in the York County Fair. 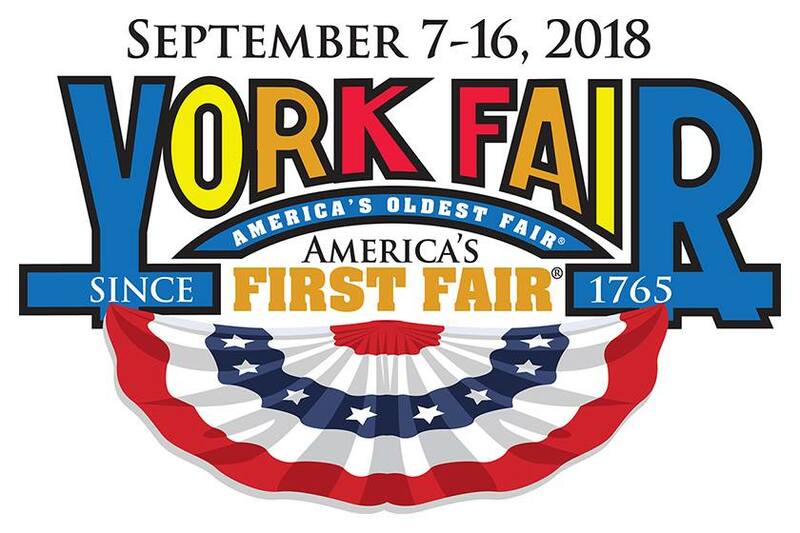 The Philippine American Heritage Council is pleased to announce its participation at America’s first and oldest County Fair at the York County Fairgrounds in the National Welcoming Week, to welcome new Americans to the United States, starting this Saturday with a dance performance by its KalayaanUSA Cultural Ensemble and it’s associated junior group, the Halo-Halo Youth Dancers. 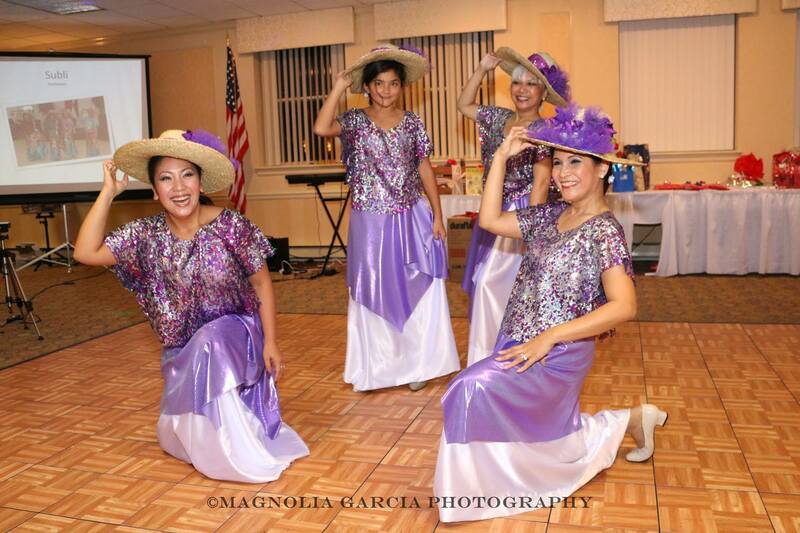 Performance of KalayaanUSA Cultural Ensemble (the Filipino word for “Freedom”) and the Halo-Halo youth dancers is from 4 to 4:30 PM at the Cultural Pavilion of the York County Fair. Don’t Miss it!! This year, the “Welcoming Week” event started on Friday, Sept. 14, and concludes Thursday, Sept. 20. 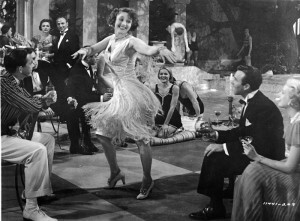 In the City of York, Central Pennsylvania, featuring various free family-friendly activities, with the purpose of strengthening the community composed of diverse heritage groups. The Cultural Pavilion at 2018 York Fair where dance 2 dance groups provided by Philippine American Heritage Council to perform Sat. 9/15/18. 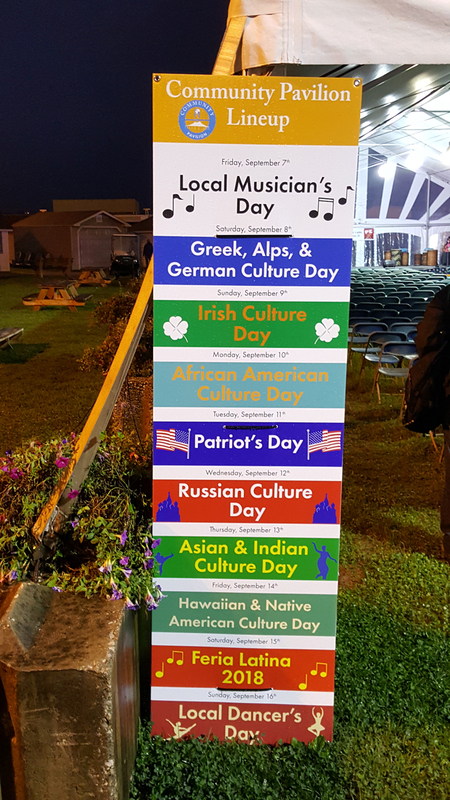 Today, September 15, the second day of the Welcoming Week intercultural celebration to be held at the York Fairgrounds, with live music and dance entertainers, at the York Fair’s Community Pavilion. The huge Community Pavilion is one of the new features of the 2018 fair. There are free daily activities and entertainment under the big tent. This Saturday will be the second to the last day of the annual York Fair. 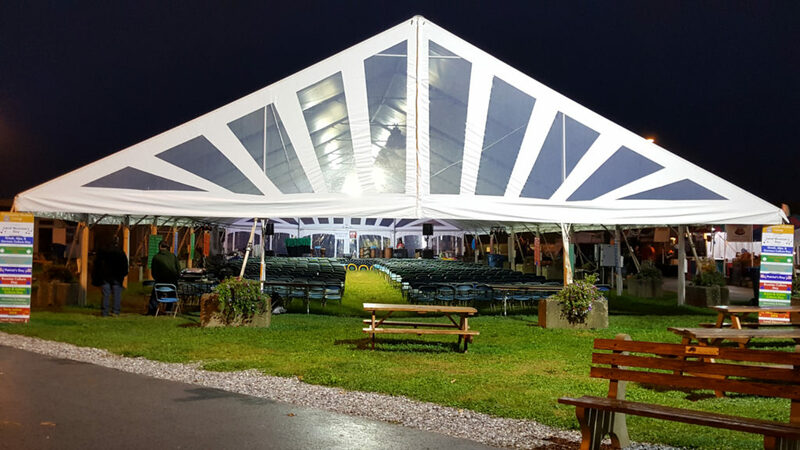 “Welcoming Week” is an annual event celebrated in different parts of the United States including this week overlapping with part of the York County Fair at the York Fairgrounds. Activities all week. Welcome week flyer HERE. The objective is to bring together immigrants, refugees and native-born residents to build common ground, stronger communities and unity.. Our goal is to help foster an appreciation of heritage and culture by showcasing colorful traditional costumes, song and dance performances, various heritage foods and other activities that will attract both residents of York City and County as well as visitors both young and old who visit this annual Fair. 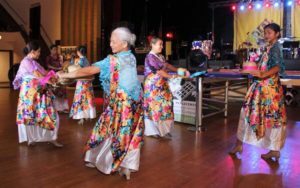 Another new features of the York Fair introduced this year is the intercultural presentation which the Philippine American Heritage Council is a founding participant. Everyday from the opening day on Friday, Sept.7, until the closing day on Sept. 16, Sunday, there are different heritage group entertainment and activities. “Cultural diversity enriches America. Together with unity – splendidly summarized in the de-facto national motto of the United States, E Pluribus Unum (out of the many, one) these values enable America to continue as the land of opportunity and the beacon of hope which attracts so many newcomers every year. We join in welcoming them during this special week,” said Emy Delgaudio, Chairman of the Philippine American Heritage Council. Emy Delgaudio also praised the Welcoming Week Advisory Committee Chair and Director of the New American Welcome Center, Jose Santiago, who presided over a series of planning and advisory meetings which she participated in during the months before the event. “His leadership and good work will result in the best “welcoming week” ever, only to be exceeded by next year’s event which will be even bigger and better, she said. In behalf of the Advisory Committee, Emy invited both the KalayaanUSA Cultural Ensemble (where she is a performer) and the Halo-Halo Youth Dancers to participate in this year’s “welcoming week” festivities for the first time. 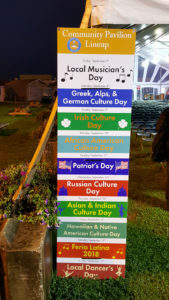 The whole day event at the York Fair’s Cultural pavilion on Saturday, will feature mostly Latin and Hispanic performers as well as performances by other dance groups, including Philippine-American and Haitian-American dance groups, then the crowning of the Miss Latina 2018, in honor and celebration of the Hispanic Heritage Month (Sept. 15 to October 15). Filipinos are very comfortable associating with the Hispanic segment of the “welcome week” event because the Philippines is a blend of American, Hispanic and Asian cultures. 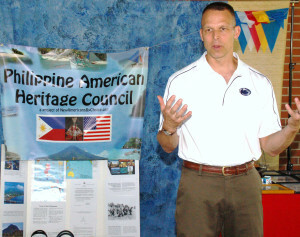 The “Welcoming Week” event is supported with enthusiasm because it helps achieve the mission of the Philippine American Heritage Council and its Kalayaan Cultural Ensemble – to share what is best about Filipino culture, history and beliefs while at the same time, sharing with our fellow “new Americans by choice,” what is great about America. The dance troupe “KalayaanUSA” (the Filipino word for “freedom”) is one major part of our outreach to achieve our mission as a non-profit organization. Another major part of our outreach is the mobile “Heritage Museum” of the Philippine-American Heritage Council, a cultural display which will be setup as its own Pavilion at the York Fairgrounds, sharing culture, history, beliefs and basic information about the Philippines and the United States (look for the white tent near the Cultural Pavilion with the PAHC banner). 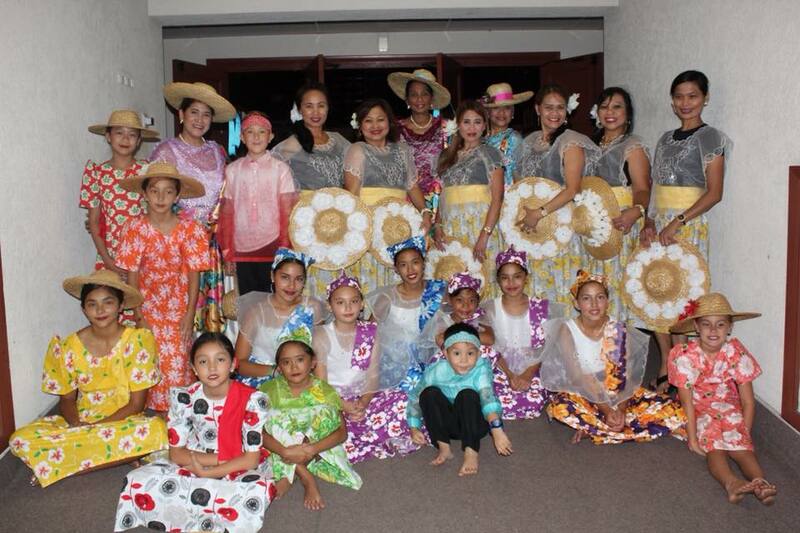 The Philippine American Heritage Council is pleased to announce through its recommendation and endorsement, that the Halo-Halo Youth Dancers will also perform at this annual “Welcome Week” celebration at the York Fairgrounds this week. Kalayaan USA Cultural Ensemble and Halo-Halo Youth Dancers will perform for 30 minutes, from 4:00 pm to 4:30 pm. 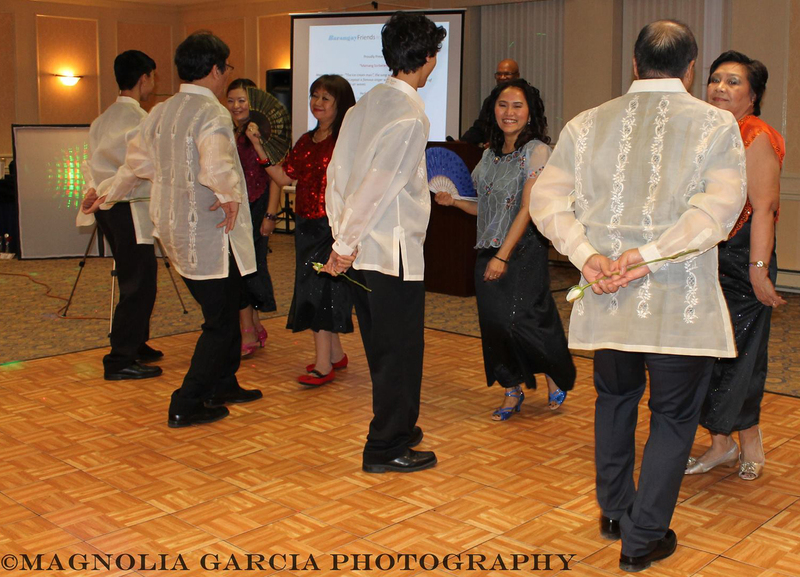 The Filipino folkdances they will perform will be Subli , Pandanggo Sa Ilaw (Pandanggo with Light), Sinisinta Kita, Princess Dance (mixed of the traditional Pag-Apir and Kzadoratan dances), Tinikling (Bamboo Dance), and Paypay de Manila (Fan Dance). These two (2) Phil-Am dance groups also performed at the recently concluded 2018 Annual Cultural Fest in Dauphin County (Harrisburg, PA), on Aug. 3, 2018. They were joined by another Phil-Am dance team called Bongga Ka Day (based in Harrisburg), which is also endorsed and embraced by the Philippine American Heritage Council. 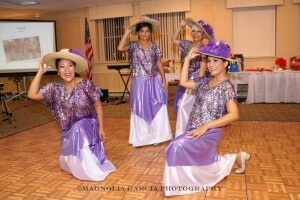 The popular all ladies dance team performed at the past two consecutive, annual summer-time Heritage Fiesta’s (next year will be annual event #8). 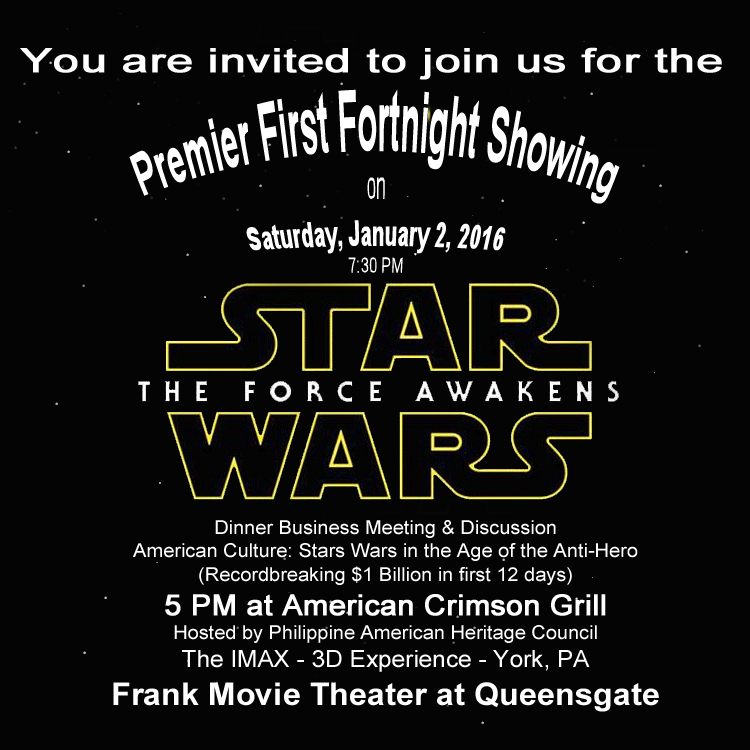 The most recent event, despite the rain, matched last year’s 100+ attendance once again. We invite family and friends of our Phil-Am community as well as Americans who want to support our work to watch and show support to our dance volunteers who have been spending time and resources in coming up with beautiful choreographies of the different Filipino cultural dances to be able to share them with different audiences in Pennsylvania, Maryland, New Jersey and Washington, D.C.
We would be grateful if you could help spread the word about these activities by circulating the “url” address of this article via your email and on your Facebook page. To obtain a free subscription to the periodic e-newsletter (for Philippine American Heritage Council and its KalayaanUSA cultural ensemble) write (provide your name and zip code) Chairman@PhilippineAmericanHeritage.org or Chairman@KalayaanUSA.org. You may also visit our Facebook page, HERE. 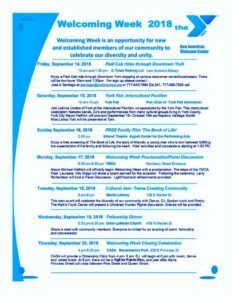 For more details of the Welcoming Week weeklong activities please go HERE. 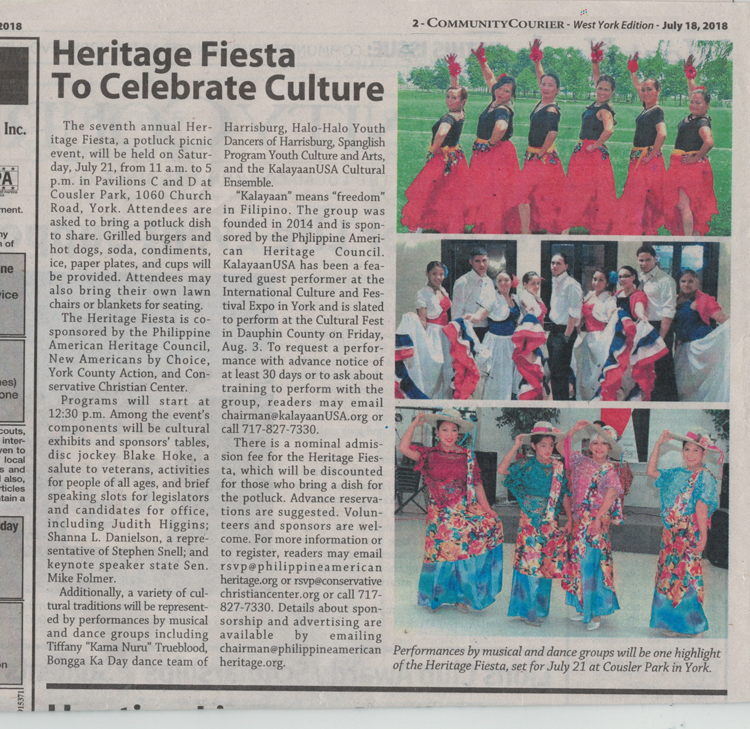 The Heritage Fiesta this coming Saturday has once again made the local news, with all editions of the Community courier weekly newspaper running the story about the upcoming 7th annual “pot luck” picnic on the highly coveted page 2 (above the fold). Don’t miss it! Here’s the story (news clip above). Don’t miss what is shaping up as the very best of the 7 annual Heritage Fiesta’s this Saturday – doors open for setup at 11 AM, food starts 12 noon, program starts 12:30 PM with keynote remarks by State Senator Mike Folmer, plus remarks of State Rep. Kristin Phillips Hill, and congressional candidate and Platinum Sponsor George Scott, County Commissioner Chris Reilly and other candidates on the November ballot (all invited). 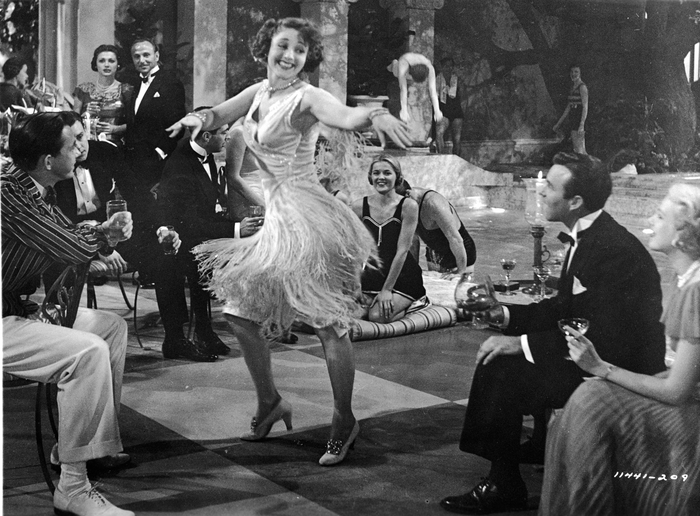 And the most popular part of every year’s event, the Dance groups which will provide entertainment along with the music provided by a DJ. 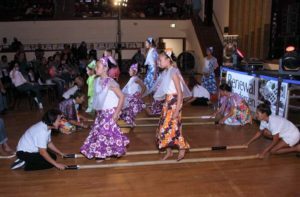 Photos carried by the Community courier are of last year’s performances by Bongga Ka Day dance group of Harrisburg, KalayaanUSA Cultural Ensemble of both Harrisburg and York, PA, the new Halo-Halo Youth Dancers and more. Organized once again by Philippine American Heritage Council and co-Sponsored with New Americans by Choice, Conservative Christian Center and York County Action. 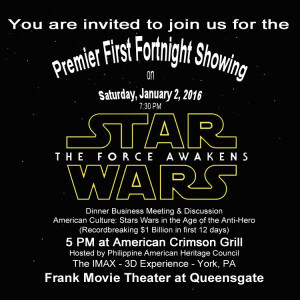 Info: Chairman@PhilippineAmericanHeritage.org. 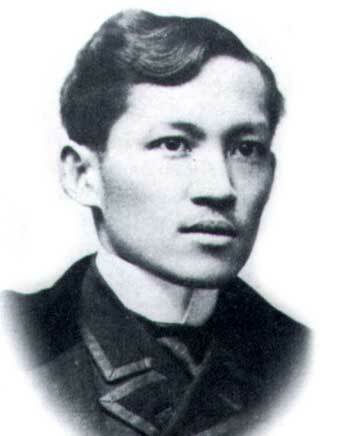 Visit PhilippineAmericanHeritage.org. 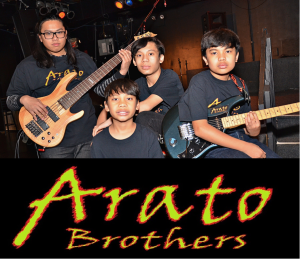 Arato Brothers to perform at Sixth Annual Heritge Fiesta “bring a dish” annual picnic on July 15, 2017 at Cousler Park, York County PA. The 6th Annual Heritage Fiesta, a potluck picnic event, will take place next Saturday, July 15, 2017, from 11 a.m. to 5 p.m., at Cousler Park, (Pavilions C & D)1060 Church Road, York, PA 17404, featuring keynote remarks by U.S. Congressman Scott Perry and allowing short speaking time for all candidates for office. U.S. Congressman Scott Perry to deliver keynote remarks in his second appearance at the annual Heritage Fiesta, shown here speaking at his first appearance, August 2013. This is the second year in which the original organizer has renamed their annual picnic as a “Heritage Fiesta” to celebrate the heritage, origins and culture of Americans, and they are joined again by co-sponsors York County Action and New Americans by Choice. A new co-sponsor this year is Conservative Christian Center. Attendees to this family-oriented, “Fiesta” event are asked to Bring-A-Dish, especially one celebrating your own heritage, to share with at least 10 to 15 people. 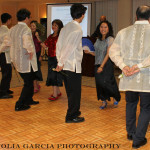 Because past events have had an overflow crowd, an RSVP is suggested to RSVP@PhilippineAmericanHeritage.org. A nominal admission is asked, $2 per person, $3 for couple & $5 for family, and bring your own lawn chairs or blankets for seating in case the limited picnic-bench seating is all filled up. Dance Troupe of Philippine American Heritage Council performing at last year’s 4th annual Heritage Picnic (this year renamed KalayaanUSA Cultural Ensemble); the mobile Philippine American Heritage Museum at last year’s picnic; this year’s DJ Terrell “Nakuu” Bryant is also an accomplished singer; Manila Menz Band of BFF (Barangay Friends ‘N Family – which is also providing a Dance Troupe again this year as they did last year), Buffet of what this year we call the “Parade of Heritage Dishes” at last year’s 4th annual event. (York PA) The Fifth Annual Heritage Fiesta of New Americans by Choice will be held this Saturday, July 30 at Cousler Park, 1060 Church Rd., York PA, 12 noon to 5 PM with a 1 PM program which includes two different Philippine Dance Troupes, and other cultural and contemporary dances performed by various heritage groups, a professional DJ with a variety of music including authentic heritage music from a variety of countries, a “Parade of Heritage” dishes from the Philippines and other countries including the famous “Lumpia” spring roll of the Philippines, a charcoal barbecue grill with hot dogs, chicken and burgers, and speeches by state legislators and candidates for office. 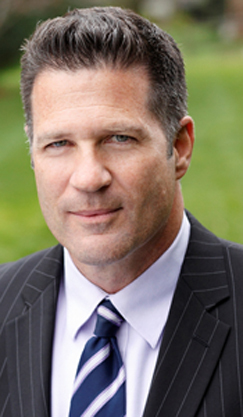 Speakers include State Rep. Mike Regan (Keynote Speaker, State Senate candidate), Rep. Kevin Schreiber, State Rep. candidate Joel Sears, GOP County Chairman Alex Shorb, York ACTION of PA President Jay McKiernan, Chief Deputy Prosecutor for York County District Attorney Tim Barker for PA Attorney General Candidate John Rafferty. Philippine American Heritage Council Chairman Emy Delgaudio with the Queen of one of the participating groups, holding the image of the Santo Nino – and with her Dance Troupe who participated in the festive and massive parade of Sinulog in Cebu City, Philippines, 2005. “Friends ‘N Family Associaton” Dance troupe will be the featured event at their annual Christmas Party Saturday, December 12 in West Chester, PA.
Free E-Newsletter & "Associate Members only" Facebook group. Complementary subscription (does NOT include membership). The Philippine-American Heritage Council is an association of Americans dedicated to preserving and sharing the best of the Christian, freedom heritage and culture of America and of the Philippines and cultivating friendship between these two countries and opportunities to socialize among those who share these views. If you agree JOIN AS A MEMBER (free), free newsletter & you may participate in the members only Facebook page. Write: Chairman@PhilippineAmericanHeritage. Note: we welcome Americans who are NOT of Filipino heritage as members of PAHC who our purpose, including their helping teach those new to America, about the American freedom tradition, and who are open to learning more about the Philippines' culture, history and traditions. Although membership is complementary we also appreciate donations to help pay for our information sharing efforts including literature, newsletters and this website as well as our functions. (Out of the Many, One) Good news for immigrants. The American Founding Fathers from the very start recognized that "out of the many, we are one." The scroll on the "Great Seal of the United States" has this Latin phrase, and this seal is the basis of the seal of the President, Congress, Supreme Court and many of the agencies and departments of the United States. The phrase "E Pluribus Unum" also appears on our coins and is a well recognized symbol of America. The motto was originally suggested by a committee which the Congress appointed in 1776 to design a seal for the new United States. The Latin phrase is recognition of the diversity of the new United States. 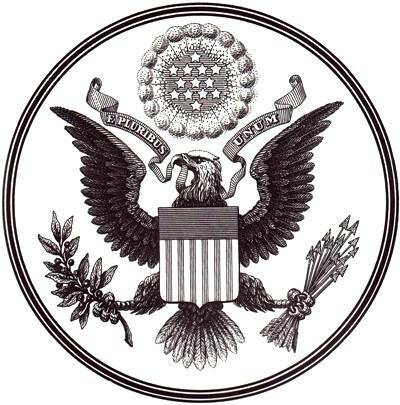 Although the seal recommended by the Committee was not adopted as proposed, the E PLURIBUS UNUM and the Eagle were selected in 1782 and are part of the official Seal of the United States. America remains a unique place in the history of the world in which many different ethnic cultures and beliefs can combine together to celebrate their diversity while still pledging allegiance to One Nation, Under God: E Pluribus Unum. - immigrants celebrating “why we are here” - and who embrace American exceptionalism while sharing the best of our past culture and history, together with Americans who are dedicated to sharing their ideals with those new to their shores.